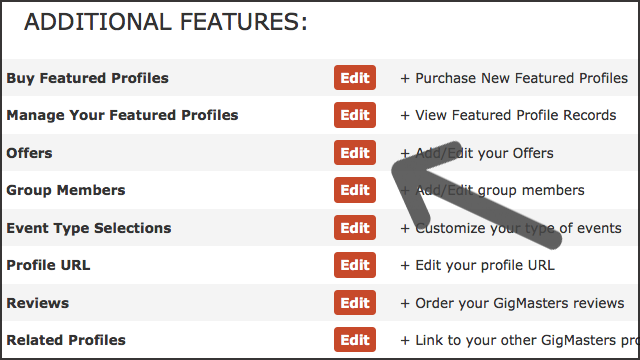 A maximum of 6 offers will display on your profile at one time. All offers are required to have at least one bullet point in the description, but no more than 4. Your offer title cannot exceed 40 characters. You will no longer be able to choose a Featured Offer. I already have Offers on my profile, what should I do? Please check out the Offers that you have listed on your live page. Based on the changes listed above, you may want to tweak them a bit to better fit the new format. I don't have any Offers yet, any recommendations? Savings & Specials: Offering a seasonal discount is an age-old marketing tactic that has proven to work well. Experiment with an upcoming holiday - eveyone loves a deal. Package Deals: Incentivize clients with additional services at a pre-arranged package price. For example, sound equipment, party lighting, addtional performers, emcee services, etc. Local City Rates: Gigs close to home are the best, right? You could create a discount for bookings within, say, 25 miles of your primary location. You'd be saving on the commute anyway. If you have have any other Offer ideas, feel free to share in the comments below!